As part of the annual music celebration, this year's event features a chance to play one of Paul's guitars and learn about his life and influences. GARDINER — To get close to one of Les Paul’s guitars, you might have to travel to the Rock and Roll Hall of Fame in Cleveland; and even then, you probably wouldn’t get to touch one, let alone play it. On Saturday, your odds of doing that will improve dramatically. As part of Gardiner’s Music Walk, Jim Wysocki and Joe Ullrich are traveling to Gardiner with some of the legendary guitarist’s equipment and instruments to play. While the Music Walk kicks off in earnest at 4 p.m., events are scheduled throughout the day Saturday in conjunction with National Record Store Day, an event that celebrates independent record stores and the people who work in them. 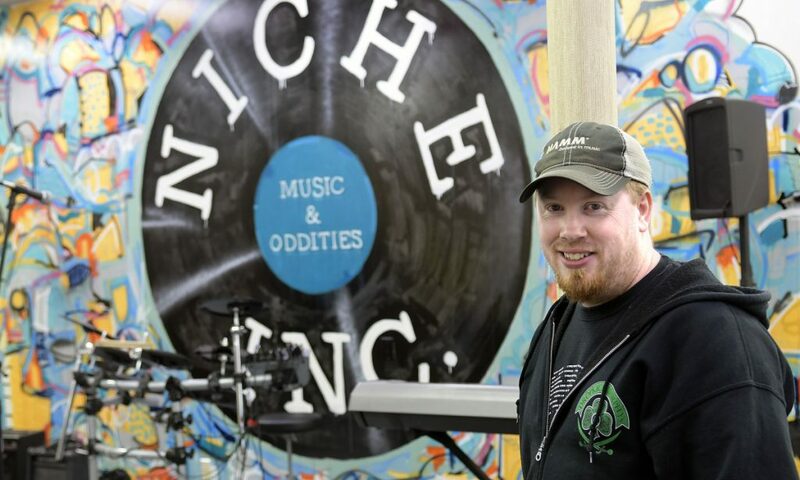 For the last three years, Samantha Robinson and Jason Goucher, at Niche Inc., their music store on Water Street, have organized a roster of bands to perform in businesses in Gardiner’s downtown. From 4 to 7 p.m., more than two dozen artists and bands are scheduled to appear, including Sassquatch at Niche, Inc., Daisy Cole at Gerard’s Pizza and Catcha Vibe at the Vapor Room. For Goucher, it’s about sharing what he loves with his community. In this case, it’s a piece of music innovation history. Paul was inducted into the Rock and Roll Hall of Fame in 1988 as an early influence — someone whose music came before the rock era and but nonetheless had an effect on how rock music evolved. Paul, a noted jazz, country and blues musician, collaborated on the design of the solid-body electric Gibson guitar in the 1950s. Paul is also known for innovating effects that are still used today in recording studios. Goucher and Wysocki met when they were both in Nashville, and Goucher eventually asked Wysocki if he’d be interested in bringing his collection to Maine. “We travel around the country with our program,” Wysocki said, but added that this is their first trip to Maine. Wysocki and Ullrich struck up a friendship with Paul before Paul died, and the three of them devised a plan to bring Paul’s collection to people and tell his story. They plan about 15 events a year, and this is the first time the show has traveled to New England. As part of the event, “Chasing Sound,” a documentary film of Paul’s life will be shown at 1 p.m. at Johnson Hall, at 280 Water St. After that, the instruments and equipment will be on display. At 7 p.m., Wysocki is scheduled to give a slide presentation and talk about Paul’s life in music. Admission is first-come, first-served. While there is no fee, donations will be accepted for Johnson Hall’s renovation of its upper opera house theater. Along with music and shopping, the Music Walk also features face painting, a drop-in drum circle and a beer tasting at Craft Beer Cellar. “Jason and Samantha have done a good job and poured a ton of energy into it,” Wright said. “It’s a great coincidence that they could market it along with National Record Store Day, and it ties together all the cultural amenities in Gardiner — Johnson Hall, Circling the Square Press, Spinoff Studios, Cattywampus Studio and Ampersand Academy of Dance and Performing Arts.